The buzz of bees catches my attention while on the trail above the Tunnel in Steep Rock. I give a quick look around the ground to confirm I haven’t disturbed a yellow jacket nest. Yellow jackets usually are aren’t a concern until late summer, but the dry, hot conditions through June have triggered early nesting in places. 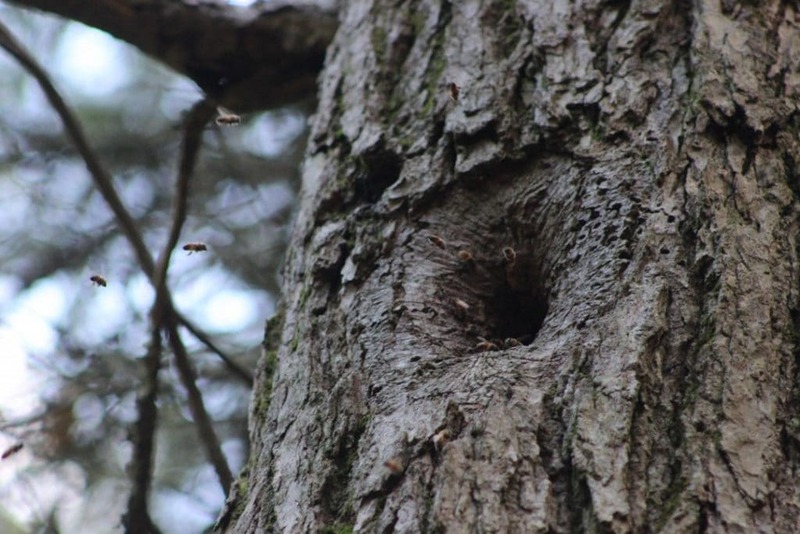 I realize with satisfaction that it is an apparently robust colony of honeybees living about 12 feet up in an eastern hemlock. They enter and exit a round cavity with purpose, many returning with bulbous hauls of pollen, indicating an active brood nest. What a treat to see this pollinator thriving in the wild, and not just in a beekeeper’s apiary.